Other photos: Photo 1, Photo 2, Photo 3, Photo 4, Photo 5, Photo 6, Photo 7, Photo 8, Photo 9, Photo 10, Photo 11, Photo 12, Photo 13, Photo 14, Photo 15, Photo 16, Photo 17, Photo 18, Photo 19, Photo 20, Photo 21, Photo 22, Photo 23, Photo 24, Photo 25, Photo 26, Photo 27, Photo 28, Photo 29, Photo 30, Photo 31, Photo 32, Photo 33, Photo 34, Photo 35, Photo 36, Photo 37, Photo 38, Photo 39, Photo 40, Photo 41, Photo 42, Photo 43, Photo 44, Photo 45, Photo 46, Photo 47, Photo 48, Photo 49, Photo 50, Photo 51, Photo 52, Photo 53, Photo 54, Photo 55, Photo 56, Photo 57, Photo 58, Photo 59, Photo 60, Photo 61, Photo 62, Photo 63, Photo 64, Photo 65, Photo 66, Photo 67, Photo 68, Photo 69, Photo 70, Photo 71, Photo 72, Photo 73, Photo 74, Photo 75, Photo 76, Manufacturer Provided Image. YACHT IS BACK IN FLORIDA READY TO SHOW!! The HATTERAS 100 RPH is the most thought out MY in the industry. You won't find another like this since is has very CUSTOM ARRANGEMENTS. This is the only 100 MY with 6 staterooms with private Heads, sleep 14 total guests and 2 rooms for Crew, ready for up to 5 crew. With a desired ON DECK MASTER, this Yacht makes it the perfect family get away. With the Open fly bridge with full independent bar with 4 stools and the double electric grill with a 2 burner cooktop, cooking and hanging out side will be the prefer area while in the Bahamas of the Caribbean. While all this is happening feel free to take a dip in the 6 person Jacuzzi. If you are going to Europe, or St. Barth or St. Maarteen, NO PROBLEM!!! The boat is equipped with an ATLAS System, so you can connect to any power 50 or 60 HZ and it will convert and protect the yacht at all times. Also, with the 2 stern windlass, it is ready to back up to any dock space in Europe. As of Oct 2018, Lady Carmen went through and upgrade of all TV's, Electronics, Computer, etc. Step up aboard this Impressive 100 rph MY and you will see that the 112' or other bigger yachts don't have what this boat can offer. SYS Yacht Sales is pleased to assist you in the purchase of this vessel. This boat is centrally listed by HOLA Yacht Sales. The Hatteras legend began on the barrier islands of the North Carolina shore where the frigid waters of the Labrador Current encounter the tropical Gulf Stream. The outcome is Diamond Shoals – home to some of the most turbulent and untamed waters in the Atlantic and some of the best sportfishing in the world. Here in 1959 at Cape Hatteras, where nor’easters can blow almost as fiercely as hurricanes, Willis Slane envisioned building a boat that could conquer the waters of Diamond Shoals and surmount the Hatteras weather. It would not be an ordinary boat – no traditional wooden fishing boat could do this. This new boat would have to be rugged and robust to take the pounding of Hatteras waters. But most importantly, it would have to be a great sportfishing boat – big enough to handle a group of avid fishermen and comfortable enough for family back at the dock. Breaking with all tradition, Slane chose a new material – fiberglass – to build this noteworthy yacht that launched an industry. Hatteras produced its first sportfishing yacht on March 22, 1960, in the town of High Point, North Carolina. Christened the Knit Wits, she was a 41-foot twin cabin sportfisherman with a 14-foot beam and a pair of 275-hp Lincoln V-8s. The response was enthusiastic and the Hatteras legend was born. This commitment to superior craftsmanship began with the Knit Wits and continues today. Whether the choice is a sportfishing convertible or a motor yacht, both deliver the "renowned Hatteras ride" in comfort and style. 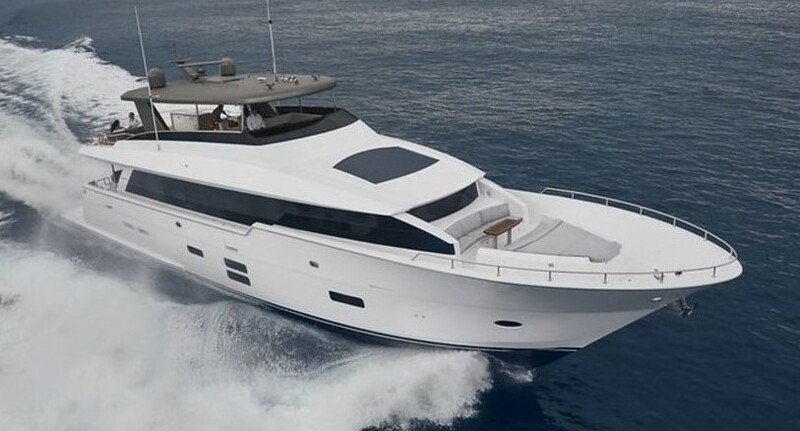 Buying a Hatteras: We offer used Hatteras Yachts for sale worldwide, including popular models such as Hatteras Motoryacht, Hatteras Convertible, Hatteras Raised Pilothouse, Hatteras Flybridge, Hatteras Sporfish and more! Contact our sales professionals for immediate assistance. Selling Your Hatteras: With a team of experienced yacht brokers and marketing professionals, we will employ a comprehensive marketing approach to ensure your vessel receives maximum global exposure online as well as exposure in person at major boat shows. Learn more about how SYS Yacht Sales will help to sell your Hatteras yacht!